While a lot of clubs will have spare sets of gloves to offer their members, these tend to be worn out, miss-matched and often, very smelly. As such, a lot of people will seek to get their hands on a new pair of gloves fairly early on. But for those new to boxing, knowing what to look out for, what size to get and which brands are best can be fairly tricky. With that in mind, we’ve created this list of the best boxing gloves for beginners. We’ve also got a buyers guide that will provide you with all the information you need to make the right decision, so make sure you check that out at the end. You may also want to consider getting a pair of hand wraps to wear underneath your gloves. We’ve listed a couple of high quality, affordable options for you to check out as well. Making sure you have a good pair of gloves is incredibly important for two main reasons. Firstly, the gloves are going to be protecting your hands. 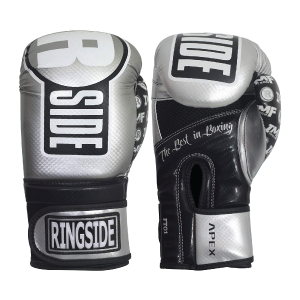 The quality of the gloves will determine how effective they are at cushioning the blow from any punches that you throw. Low quality gloves could leave you with an injured hand, especially when you haven’t fully got a grasp of the technique. Trying to save money and buying a cheap pair of gloves is only going to cost you more down the line. Many boxers have made this mistake, myself included. I thought I’d save a few bucks, get a cheap pair of gloves and I’ll be set. Unfortunately, spend less now and you’ll spend more down the road. Due to the nature of boxing, cheap, ill-made gloves will fall apart very, very quickly. Learn from others mistakes and get a good pair of gloves from the offset, you won’t regret it. Ok, let's crack on with the reviews. 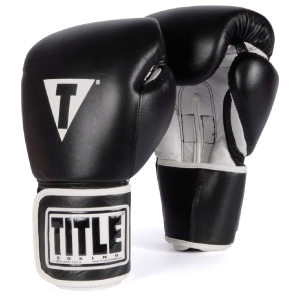 As a beginner getting into boxing, you can’t go wrong with a reputable brand such as TITLE. Their Pro Style training gloves will give you a taste of what high quality gloves feel like, whilst not being overly expensive. As any boxing enthusiast will tell you, genuine leather gloves are the way to go. Genuine leather is the most durable material used to construct gloves and allows them to be used for years on end. Unfortunately, genuine leather gloves typically come accompanied by a fairly hefty price tag. However, that’s not the case with the TITLE Pros Style Gloves. Despite being made using top quality materials, they’re very budget friendly and therefore perfect for beginners looking to spend on a budget. One area that’s particularly important to pay attention to is the padding, especially if you’re just beginning boxing. The TITLE gloves make use of a multi-layered foam padding, constructed with both high and low density foam. Not only does this provide a ton of shock absorption, it also dissipates the force equally around your hand and wrist. 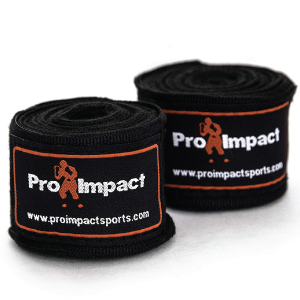 This is particularly ideal for beginner boxers who may not have the best form and therefore need maximum protection. One thing you’ll notice as you continue to use a pair of boxing gloves is the smell. Poor quality gloves will allow sweat to be absorbed into the padding, causing a build up of odour. In order to help prevent this, TITLE has implemented a satin nylon lining on the inside of the gloves. This helps to wick away moisture, in turn reducing the amount of sweat that builds up inside the gloves. The TITLE gloves are available in 10-16oz, increasing in increments of 2oz. If you’re looking for all round training gloves, I would suggest going for 14oz or 16oz, as these will allow for you to partake in all the different elements of boxing training i.e. - pad work, sparring and bag work. For the price, these are probably the best value for money gloves you’re going to find and are absolutely perfect for boxing beginners. Up next we’ve got the Ringside training gloves. First of all, if you’re planning on sparring, these may not be the best gloves as they’re fairly lightweight. If you do spar in them, there’s a good chance you’ll be making some enemies down the gym. With the small/ medium size weighing in at 10oz, and the large/extra large size weighing in at 12oz, these gloves are designed for pad work, and light bag work. 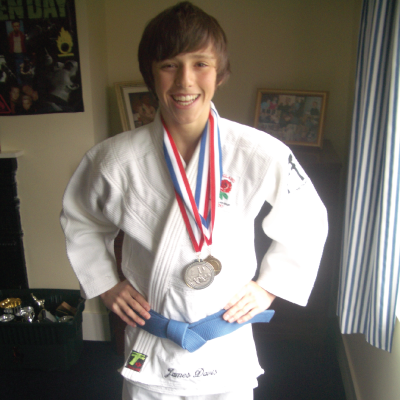 As a beginner, there’s a slim chance you’ll be sparring, so it doesn’t matter too much. Just be aware that if you want to spar further down the line, you’ll need some 14oz or 16oz gloves at least. In terms of protection, Ringside have gone all out with these gloves. They’ve used injected moulded foam (IMF) padding in order to provide the gloves with durable protection that will consistently safeguard your hands, even after years of use. The shape of the gloves themselves have been designed to align with the natural curvature of a hand, allowing for a super nice fit that doesn’t slide around, even if your hands get sweaty. Inside the glove is also a grip bar that allows you to tightly make a fist when throwing a punch. This will help to prepare you hand for impact and help to reduce the chance of sustaining an injury, which is an extremely useful feature for beginners. I also really like the mesh palm, as this will keep your hands cool whilst training. Even when your hands do start to sweat, the moisture wicking lining will prevent the vast majority of it from being absorbed into the gloves. Both of these features will allow your gloves to smell fresh for longer, which is always a good thing as smelly gloves aren’t nice to train in. If you’re into Muay Thai, you definitely will have heard of Twins. They’re absolutely massive and have started to use their expertise to tailor their gloves towards boxing enthusiasts. 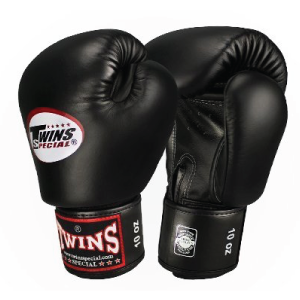 As such, their Twins Special gloves are a very popular choice amongst beginner boxers thanks to their high quality craftsmanship and reasonable price tag. The gloves are made using genuine leather, which as I mentioned earlier, provides a ton of durability. This means that although the gloves cost slightly more, you won’t be need to buy another pair for a good few years, even if you’re training on a regular basis. Twins pretty much offer everything you would look for in a first pair of gloves. They provide ample wrist support, high impact padding and fit like a glove (excuse the pun). What’s more, the gloves are available in a wide range of sizes, as well as provide you with the choice between black, blue and pink. I like my gear to maintain a similar aesthetic, so it’s always good when you’ve got the choice of a few different colors. All in all, a great pair of gloves that are sure to be loved by anyone starting their journey in boxing. We’ve got another brand that made waves in the Muay Thai world and have opened up their doors to boxing enthusiasts. 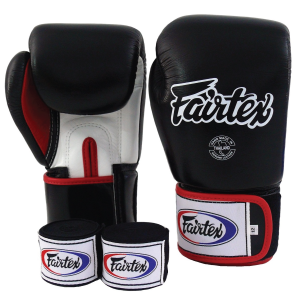 This time we’re taking a look at the Fairtex Training Gloves, which also come alongside a pair of Fairtex hand wraps. This is perfect for beginners, as the chances are you’ll need to get a set of hand wraps anyway. This way you’ll save a bit of cash, and get a great pair of both hand wraps and boxing gloves. As with the vast majority of Fairtex gear, their Training Gloves are handmade in Thailand, home of Muay Thai and where some of the best quality gloves are made. Fairtex are known for their rigorous quality control and often test their gloves for years before allowing them to be purchased. As such, their gloves tend to last for an incredibly long time. I know some guys that have had a pair of Fairtex gloves for 5+ years, and those things have seen some battles. The hook and loop closure system fastens the gloves tightly to your hand, as well as provides your wrist with the support needed to land high powered punches. What’s more, the gloves come in a variety of different sizes, ranging from 12oz-16oz. This weight range is perfect for beginners looking to get a versatile pair of gloves that can be used for all aspects of training. If you’ want to spar, I would suggest going for the 14oz or the 16oz, as these are the most padded. Considering the overall quality of the gloves, it’s surprising you can get these for less than $100, plus with a pair of hand wraps thrown in. 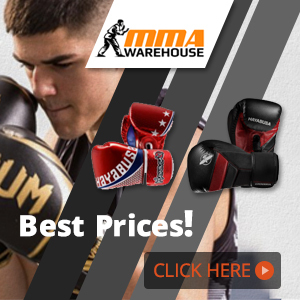 It’s a bargain, especially if you’re a beginner wanting to experience top quality gloves and hand wraps on a budget. I know what any experienced boxer reading this is thinking “what the hell is he doing including Reyes on a beginners boxing gloves list?!?!”. And I get you, they’re expensive. But, there’s nothing wrong with someone new to boxing getting a pair of top quality gloves. The Cleto Reyes break in incredibly quickly, offer unmatched durability and possess some of the most protective padding I’ve ever seen on a pair of boxing gloves. Admittedly, they’re on the high end of the spectrum in terms of price. But, if you take into account that these gloves are suitable for heavy bag work, sparring, pad work and general training, you’re only going to need on pair of gloves. Plus, there’s no denying that these gloves will last for years. Literally years. There’s a reason why Cleto Reyes gloves are used in World Championship boxing fights, and that’s because they’re the best. Understandably, spending north of a hundred bucks on a pair of gloves isn’t ideal for every beginner. But if you want a taste of true boxing craftsmanship, handmade with genuine leather, then there’s no other way to go other than Cleto Reyes. If it’s in your budget, these really are the best boxing gloves for beginners, intermediates and even professional boxers. Don’t worry though, I’ll start getting to some cheaper gloves next on the list! 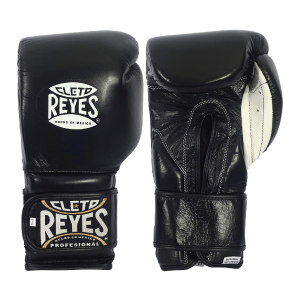 We've also got a full Cleto Reyes Training Gloves review if you want to check that out for more information. 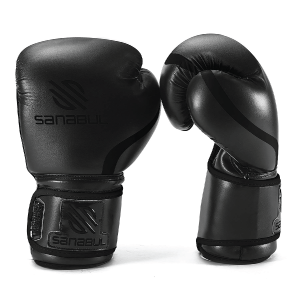 Up next we’ve got an incredibly affordable pair of gloves from Sanabul, a company known to produce great quality gear tailored specifically for beginners on a budget. These entry level boxing gloves are made using synthetic leather, which is man made leather designed to mimic genuine leather, both in terms of durability and looks. While it’s not as durable as genuine leather, it does hold up very well and is more than suitable for beginner boxers looking for a set of training gloves. I personally love the mesh palm design that allows a lot of breathability to the hands. This in turn will allow your hands to stay cool whilst training, keeping your gloves smelling fresh for longer. In terms of protection, Sanabul really have gone all out. They’ve made use of gel infused foam, which is far more protective and shock absorbing than regular, multi-layered foam you usually see in boxing gloves. Protection is an incredibly important aspect of boxing gloves, especially for beginners who may have improper technique and therefore at increased risk of injury. 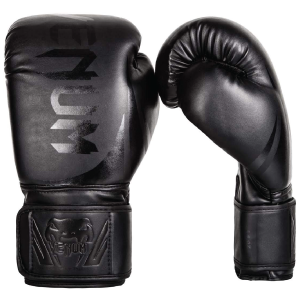 Venum are a very well known brand of different martial art and combat sports gear and equipment. Their second rendition of their Challenger gloves are designed for beginner boxers looking for an entry level pair of gloves that’s easy on the wallet. As such, Venum have used synthetic leather to construct their Challenger gloves. As I mentioned earlier, this isn’t quite as durable as genuine leather, however is significantly cheaper and definitely durable enough for any beginner training classes. These are essentially a boxing beginners dream pair of gloves - their cheap, durable and highly protective due to their triple density foam padding. I love the elasticated hook and loop closure system of the glove, as it allows the gloves to be tight fitting, preventing them from slipping around once you start to get hot. Venum are known to offer their gear in a variety of different designs, and true to their reputation, offer their Challenger 2.0 Gloves in 18 different combinations. This is great if you’re anything like me and like your gloves to match the rest of your gear. All in all, these are definitely one of the best boxing gloves for beginners thanks to their protective design and relatively cheap price tag. RDX are another brand that’s an extremely popular choice for beginners. A couple of guys in my gym started a few months ago and obviously bought their gloves together. Both have these gloves and they hold up incredibly well, I’m very impressed with the quality, especially considering the price. The gloves are made using full grain cowhide leather, which is one of the most durable types of leather used in glove construction. It’s pretty rare to find gloves at this price range that use genuine leather, so they’re definitely a great option. I’ve also noticed that the hook and loop closure system is extremely easy to take off and do back up again. This is pretty important for a pair of training gloves, as you’ll be taking the gloves on and off throughout the class. 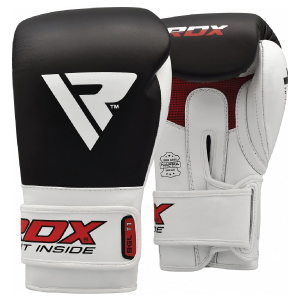 The RDX Gloves feature all the tell tale signs of a great pair of boxing gloves. They’ve got a moisture wicking inner liner, an inside grip bar and most importantly, feature gel infused padding for maximum hand protection. When you consider the price of these gloves, they’re definitely up there in terms of value for money and are a great candidate for anyone shopping on a budget. I don’t personally like the design of these gloves. I find them a bit boring. 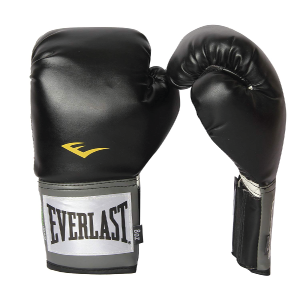 I’m not the biggest fan of Everlast, but their Pro Style Training Gloves are one of their few gloves that I recommend. While they’re not going to last forever, they’re a pretty good choice for beginners looking to dip their toes in the boxing world without spending a fortune on gear. The gloves feature a large ventilation mesh on the palm area, designed to keep your hands cool whilst training. Similarly, the inside is lined with antimicrobial material that'll wick away any sweat and prevent odour from building up inside of the gloves. The use of dense, dual layered padding makes the Everlast Gloves a great option for heavy bag work, as well as general training and pad work. It’s always good to find a pair of gloves that tick all the boxes, especially if they’re your first pair. While these aren’t necessarily the most durable pair of boxing gloves in the world, they’re definitely suitable for beginners training once or twice a week. Having a pair of boxing gloves is just the first step. 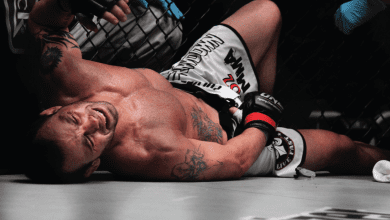 Chances are, you're going to need a good pair of hand wraps if you want to offer your hands the maximum amount of protection. Wearing hand wraps is also a great way to tighten up the fit of your gloves if they’re a bit on the large side. Below I’ll list a few good options for you to check out if you’re on the hunt for some wraps. 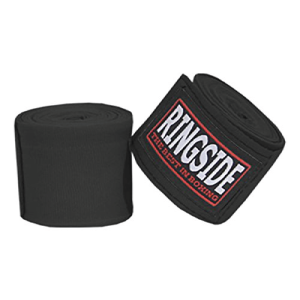 Ringside offer their hand wraps in 10 different color variations, allowing you to match them to your gloves and the rest of your gear. The wraps measure in at 180 inches and are made using an elasticated cotton blend material. These wraps are machine washable, however it’s always a good idea to grab a couple of pairs. This way, you’ll have a fresh pair to use whilst the other pair is in the wash. The wraps also feature a thumb loop that allows you to easily wrap your hands, which is particularly ideal for beginners wrapping their hands for the first time. I’ve had a fair few pairs of Pro Impact hand wraps over the years. I like the feel of the material and their slight elastication makes them easy to get on and allows you to get the wrap super tight. As you would expect, the wraps are available in a ton of different colors and measure in at 180 inches. 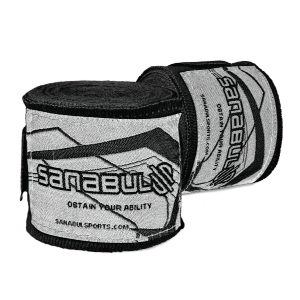 Sanabul offer the cheapest out of the three hand wraps we’ve listed. It’s only a couple of bucks cheaper, but still, every cent counts. I’ve never used these wraps personally, but I’ve read a plethora of positive reviews online and they seem great value for money. Next time I’m in need of a fresh pair of wraps, I’ll to be giving these a try. Now we’ve taken a look at some of the best boxing gloves for beginners, let’s discuss how to determine which gloves to buy. The first thing to look out when finding a new pair of gloves is their size. While a lot of brands will offer their gloves in weight, some companies categorise their gloves in small, medium and large. It’s worth noting these sizes can vary from brand to brand. This means that a small with one brand, could be a completely different size in another. If you find that your gloves are slightly too large, you can always wear a pair of hand wraps which will help to fill out the gloves. As you probably know by now, boxing gloves are typically categorised by weight, incrementing every 2oz. Different weight gloves are ideal for different elements of boxing, whether that’s competing, heavy bag workouts or sparring. I’ll quickly list out the different weights you’re likely to come across and what each one is suited for. As a beginner, it’s often best to go for 14 or 16 oz gloves. This way you won’t be limited to just pad word, nor will your gloves be overly heavy. What Material Do They Use? The material used to construct the gloves will often determine their overall quality. Higher quality leather will most likely cost more, however as I mentioned earlier, if you spend more now, the less you’ll have to spend later replacing your gloves. Genuine leather is always the best option to go for. Ask any experienced boxer what the best gloves are made of and they’ll almost definitely say genuine leather. This is largely due to the fact that leather is the most durable type of material used in boxing glove construction. For example, there’s a reason why professional boxers wear genuine leather gloves when competing, it’s because they’re the best. Plus, genuine leather has far less of a break in period than synthetic leather gloves, which allows you to get into the full swing of training quicker. I’ve also found genuine leather gloves cooler, meaning that my hands sweat a lot less compared to when I wear my synthetic leather gloves. This is purely anecdotal, but I’ve found this causes my genuine leather gloves to smell far less than my synthetic leather gloves. Synthetic leather, also referred to as PU leather, is designed to mimic genuine leather, whilst being a lot cheaper. I’ve experienced good synthetic gloves, and I’ve experienced bad ones. Admittedly, they do wear out a lot fast than genuine leather, but it’s expected when you’re paying that much less. While a pair of gloves being made out of synthetic leather is by no means a deal breaker, just be aware that you may be buying a new pair a year or so down the line (depending on how much you train of course). I’ve found that if you’re training once or twice a week, synthetic leather gloves will do just fine. The amount of padding a glove has to offer will correlate directly with the gloves weight. More padding = a heavier pair of gloves. When you’re looking to buy your first pair of gloves, it’s normally a good idea to get some that are relatively well padded. This is due to the fact you may be throwing punches with improper form, and therefore the extra protection is needed to protect your hand. Also, by having a well-padded pair of gloves, you’ll be able to work the heavy bag safely, and maybe even spar if you’re feeling up to it. When looking for a new pair of boxing gloves, I like to pay attention to the palm area. If a glove doesn’t have breathable mesh around the palm, the chances are it’s going to get pretty hot. As I mentioned earlier, this is going to cause your hands to sweat more, which can in turn cause your gloves to smell. It’s also a good idea to check out whether or not a pair of gloves is lined with moisture wicking materials. This material will help to prevent any sweat from getting absorbed into the padding of the glove, which again, will cause the gloves to smell. While it’s pretty much inevitable that you’re gloves are going to end up smelling, these small features will make them nicer to wear, and at least keep them smelling fresher for longer. The type of closure system is another aspect that should be considered. There are two main types of closures that you’ll come across - lace up and Velcro hook and loop. Lace Up gloves are the traditional type of boxing gloves you’ll see in competitive boxing matches, however are on the unpractical side of things for training. This is because it can take a while getting the gloves on, then taking them off to hold pads, and then putting them back on again. Not only is it annoying to do, it’ll eat into your work out time. Admittedly, lace up gloves to provide your wrist with more support and provide a tighter fitting glove. However when training, stick to hook and loop gloves as they’re far more practical. What do we recommend as the best boxing gloves for beginners? Well, we’re going to recommend two as our top rated - a budget friendly pair and a more expensive pair. 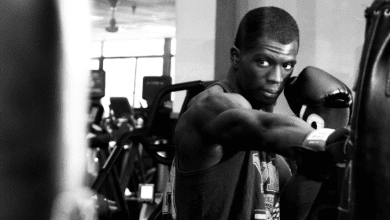 Thanks for taking the time to read our list of the best boxing gloves for beginners. If you have any questions, feel free to get in touch, or you can leave a comment down below.